All the trips and the time with friends! Since we were the first team in western NY, we did a lot of traveling in order to compete. I loved the road trips to PA, IN, MI, OH, and of course, Nationals. We had a special couple in our church, Bud and Sandy Conley, who used to drive our team to tournaments in their motor home. It was such a blessing to be together as a team to study and play games. My first Dairy Queen Blizzard in 1986 when Nationals were at Central College in McPherson, KS! Being named the Charter Member of the Pearce Memorial Bible Quiz team when I graduated. I learned more of God’s Word than I would have had I not been in quizzing. Studying it and memorizing it affected the choices I made and the way I lived, because I had God’s Word directing me and guiding me. The guidance and support I received from my coaches, as well as their examples of Christian living, really influenced my life as well. Finally, the friendships I developed with my teammates really strengthened my faith. We talked together, prayed together, and encouraged and supported each other as Christians. The continued impact quizzing has had is amazing! I still know quotes I memorized, and they provide comfort, guidance, encouragement, wisdom, and strength when needed. Many verses and passages have become more meaningful as I experience life as a husband and parent, than they were when I was a teen. God’s Word is living and active, and always relevant! I’m so thankful that all 4 of my kids have quizzed or are current quizzers. In addition to Bible Quizzing, I’m currently the team lead for our Usher team at church, and help with the Finance team. 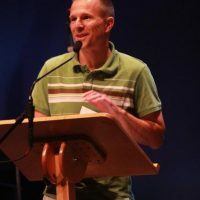 I was part of the launch team that started Freechurch, have been on the church board, and was a delegate to the conference. Over the past 2 decades, I’ve also served as a Sunday school teacher in Kids JAM, a leader in Boys Brigade, and a coach for Upward Basketball and Happy 5 Soccer.